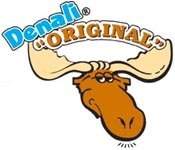 Denali Flavors is perhaps best known for its signature flavor, Moose Tracks, which swept the nation in the mid-90s and remains so popular today that it outsells vanilla in some brands. Denali also manufactures a large variety of ice cream inclusions—cookie/cake dough, fudge sauce and candies. Ice cream featuring flavorings and inclusions from Denali are available at most major grocery store chains, ice cream shops and convenience stores nationwide. Denali Flavors has grown to become one of the nation’s leading innovators and marketers of premium flavors for the ice cream industry.